Don’t say you weren’t warned! Even though camping capacity for Extrema Outdoor 2015 has been doubled, it is now totally sold out, in addition to the holiday tickets. No need to worry though, you can still attend Extrema Outdoor Belgium as Weekend and Day Tickets are still available! But, as you know, these tickets will be gone before you know it. 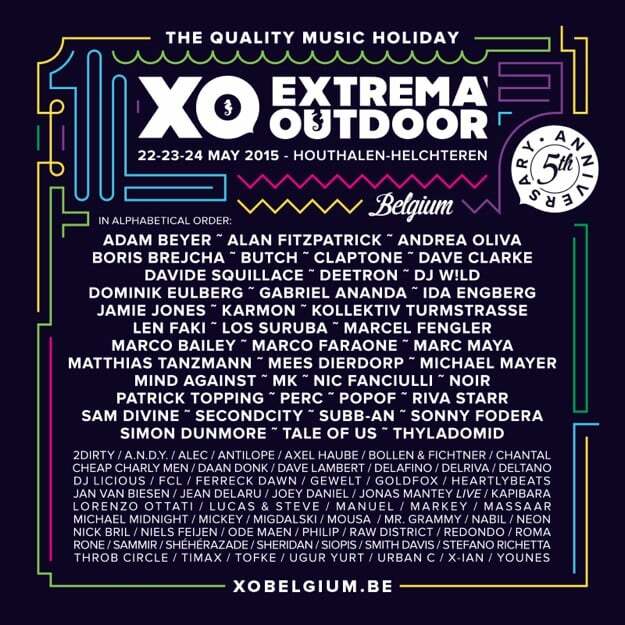 With both house and techno on the bill, Extrema Outdoor’s 2015 edition represents a mouth-watering lineup of the crème de la crème of dance. On the housier side of things will be the likes of Jamie Jones, Tale of Us, Andrea Oliva, Nic Fanciulli, Mind Against, Matthias Tanzmann, Butch, Riva Starr , and Claptone (to name a few), while Adam Beyer, Ida Engberg, Alan Fitzpatrick, Dave Clarke, Len Faki, Marcel Fengler and more bring the techno sound. Since there are no less than thirteen musical areas on-site, every itch is guaranteed to be scratched on the extended Pentecost weekend. With stages organized by Ibiza’s Circoloco, Elrow and ANTS, Drumcode and Defected holding down the record labels and renowned nightclubs La Rocca, Labyrinth Club and Café d’Anvers bringing the best of their scene to the festival, deephouse, techhouse and techno aficionados can join hands for three days not easily forgotten. Extrema Outdoor is one of the Netherlands’ oldest electronic music festivals. It has been held in various locations since it debuted in 1996, hosting hundreds of DJs and thousands of up for it partygoers with each edition. As it has in the past, The Kelchterhoef Park in Eastern Belgium will host the three-day, offering partygoers the option to camp or to commute to the festival site each day.